If you’re looking for love while you play slots on line then look no further than Cupid’s Arrow, a romantic 5 reel destined to get your heart pounding. Meet the angelic cherubs in the clouds and spin your way through 25 pay lines making sure you keep an eye out for the golden heart scatter symbol. This game is heavenly! Eyecon is one of the leading developers of slot games, combining simplicity, quality and creativity in order to construct fun and financially satisfying experiences that bring players back to their games again and again. They have something for everyone and for every occasion. Cupid’s Arrow is a bubbly and fun option for Valentine’s Day, or for any time when you feel love floating in the air. 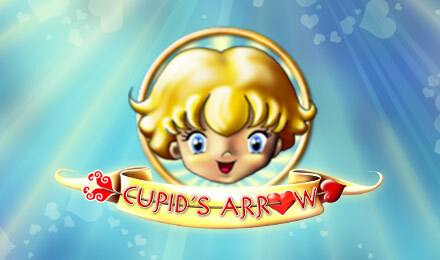 Let yourself be carried to cloud nine, accompanied by Cupid and his playful arrows, and strike Bonuses together. There are more general Easy Slots promotions, read more. In Cupid’s Arrow, this love thief doesn’t bring just romance, but also prizes! All of your wishes can come true in this beautifully designed slot game, making use of a dreamy and relaxing theme, which will surely make you fall in love. For the hopeless romantics out there, this slots experience will wake up the butterflies in your stomach and make them dance to the rhythm of your heart. High up in the sky, you will find heaven is real and all your desires are waiting to become reality. Allow the God of Love to take care of you in this majestic display of passion. This slot game holds the power of love in its 5 reels and 25 paylines, waiting for you to discover all its wonders. The background is ripped right out of heaven, where only good and adorable things reside on top of puffy clouds: hearts, teddy-bears, flowers and angels. Make sure to leave all your worries behind and embark on this slots journey with your heart right open, waiting for Cupid’s Arrow. Walk among the clouds and choose a bet from 1, 2, 3, 5, 7, 10, 15, 20, 25, 30, 40 or 50 credits, and the number of lines between 1 and 25. Them the romance begins! The adorable animations only complete the angelic atmosphere of Cupid’s Arrow and by the time you start winning, you’ll have heart eyes. Why not spin slot games today and claim your free spins. This slot game’s Bonus Features and symbols nicely compliment the theme. As you might expect, the Wild card you should look out for is the golden heart symbol, which will replace any other symbol besides the Scatters, and will even double your win. It must be love at first sight! The cloud heart, candy heart and the charming Cupid himself are the Scatters and they can bring you lovely prizes! Spinning 3 or more cloud hearts will activate the Match & Win Bonus, where you have the opportunity to choose clouds until you find the pairs and receive a Multiplier value from Cupid, who’s watching and rooting for you. 3 or more candy hearts will sweeten your experience with Cupid’s Arrow’s Prize Pick Bonus, while 3 or more Cupid symbols will unleash the love god’s generosity and you’ll be given up to 9 Free Games. This 20 payline, 5-reel slot game seems like a match made in heaven for you. Play now and win to your heart’s desire! Learn more about how to use mobile slots deposit. 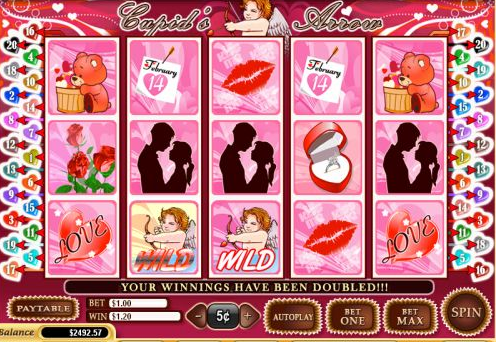 Cupid’s Arrow provides a romantic slots experience that will lift you above ordinary life, with a charming theme and more hearts than you could ask for. If you can’t hide your feelings and passion anymore, let Cupid take care of your love life and start winning big! Another enchanting game to try is our Mega Moolah Slots Game.